We have created a package aimed at girls with magazines designed to help schools close the literacy gap. 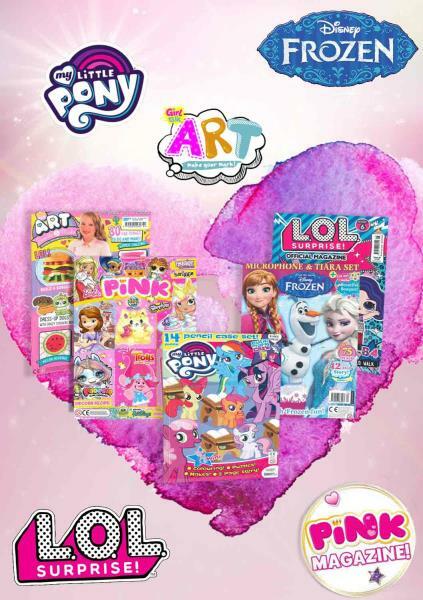 This pack consists of Girl Talk Art, LOL Surprise, Frozen, My Little Pony, and Pink. Please note, we can tailor bespoke packages where you can personally choose from a selection of over 3,000 magazines! Buy this primary school magazine package or browse our other packages. Girl Talk Art is the perfect magazine for art-loving children who love to design and create. It allows readers to discover and express their creative side through drawing, collaging, fashion designs, art techniques, gifts and many other projects. LOL Surprise is based on the collectable craze of limited edition dolls that has taken the world by storm. Every magazine is filled with fun facts and quizzes, puzzles, crafts, and 7 surprises! Frozen is for readers to continue their Frozen experience from the power of print. Each issue follows the adventures of Anna and Elsa in Arendelle, through brilliant stories featuring all their favourite Frozen characters, fun activities, puzzles, crafts. My Little Pony teaches readers about friendship reminding them friendship is always more important than the competition. The magazine is based on the Mane Six, each character is designed to depict a different element and positive aspect of friendship. Pink is fully packed with children’s most loved cartoon characters such as Barbie, Shimmer and Shine, Sofia the First, Shopkins, Trolls, Hatchimals and so many others. Each issue is filled with pictures, stories, games, prizes, free gifts and so much more!